Tonight I was laying in bed next to my son Thatcher before he went to sleep for the evening. With the lights off, we spent time talking about our days and ended our time together humming classical music tunes seeing if we could guess the other’s song. Now I must add that my son has been studying different composers at school (his mother is his fabulous teacher). We traded songs for a few minutes. Then he starts humming through a song for which I had no clue. He turns to me afterward. Silence. I tell him I didn’t know the song and he says, “Dad, it’s from the Romantic period.” like that was going to be the hint which would easily get me over the top. 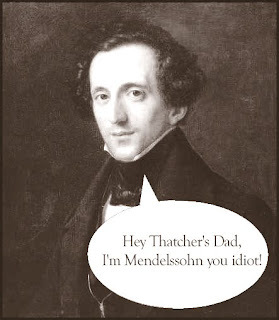 “Oh yeah,” I reply not letting him see me silently laughing, bemused at the fact my kid thinks everyone (including his dad) should know Mendelssohn, and correspondingly, the Romantic period of the mid-19th Century by memory. I’m giving his mother a raise.